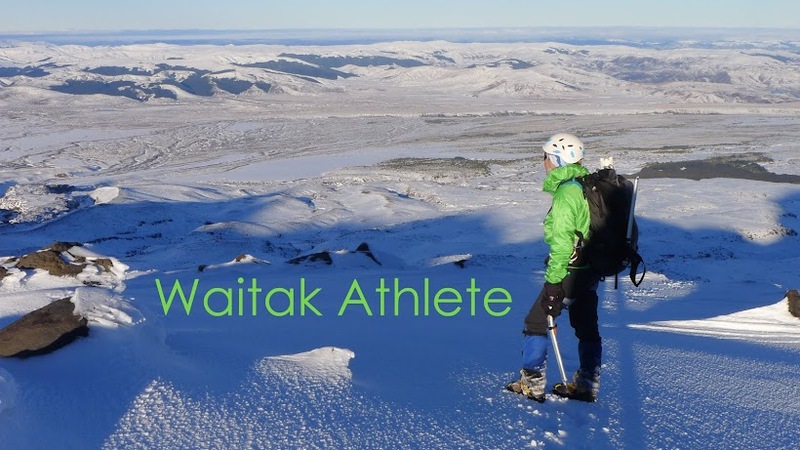 When an invitation to a Girls' Trail Running Weekend in Taupo arrived from Kate (of Kori Kita) I jumped at the opportunity to explore new tracks with like-minded people. I picked Jo up from Devonport, and we headed south just after 1pm. A smooth journey saw us arrive at Acacia Bay at 5pm. Time to settle in and then a wait to see if anyone else was going to turn up. In the end there were only the three of us who ran on Friday night. Kate (and Red) took us along the lake edge a short distance before heading up the hill into the forest. The evening was perfectly still and clear and surprisingly warm. Not a ripple on the lake and myriads of stars twinkling above. Every so often we paused to simply soak in the beauty of our surroundings. A gradual winding ascent through the pines, then a quick drop down Blue Ridge and along a few roads back to Acacia Bay. By this time it was 9pm so we quickly rustled up some chicken & pasta for dinner. Breakfast at 7:30am. Blue sky and no wind – Lake Taupo was still like a mirror. Drove to Kinloch and met Shannon at 9am. The plan was to run down the 20km Great Lake Trail to Kawakawa Bay and over to Kinloch. However, Kate had forgotten her pack so she dropped Jo, Shannon, and me at the trail head then dashed home to collect her gear before running in to meet us from the Kinloch end of the track. I was eager to get running so went out fairly fast to begin with. Very gradual downhill on pumice tracks, at first through farmland scrub then slowly entering proper bush. Ran by myself for the first 10km down to Kawakawa Bay where I lapped up the wilderness views while I waited for Shannon. For the next few kilometers we ran together and I learnt a lot about training and racing from Shannon. Kate joined us roughly 5km from Kinloch. A short stop at Kinloch to refill water and for Shannon change shoes before Shannon and I headed up the W2K Track while Kate ran back along the Kawakawa Bay track to meet Jo. After a 300km training week Shannon wasn’t feeling too sharp, so I forged ahead at my own pace and ran the next 20km by myself. 5km of runnable uphill brought me to the turnoff for the Headland Loop. This track is quite tight & twisty but a bit softer underfoot than the main trails. A few good lookouts along the way. By this time the breeze had got up and clouds were threatening rain. About half way round I realised that I had underestimated how much water I would need and my supply was getting low. Managed to eke it out until about 2km from the end. Jo & Kate were waiting inside the Kinloch store, welcoming me with some much appreciated hot chips. 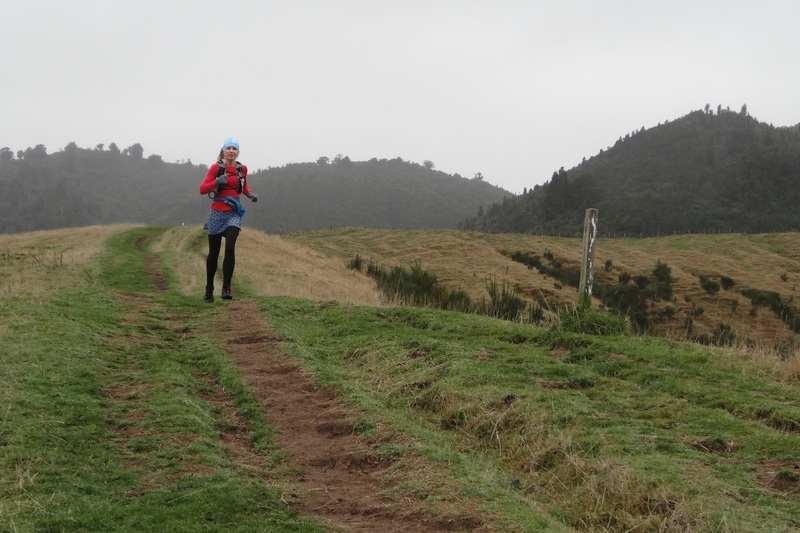 The tracks were completely different to what I was used to, and much easier than running in the Waitakere Ranges. My lower legs felt the constant pounding on the hard pumice while my quads hardly felt like they had done anything. Normally after a long trail run my legs are smashed, but this time I still felt fresh. The tight, windy mountain bike tracks with no roots or rocks did get a little monotonous at times. The hills were all entirely runnable, but the total ascent was only 670m over 40km. Jo was exhausted so we dropped her back at the house then Kate took me on a quick jaunt down to the Acacia Bay caves. Headed back and hopped into the spa pool – fantastic recovery session! Relaxed in the tub for an hour and a half before deciding it was time to get dinner. Two of Kate’s running friends, Tilly & Sandy, joined us for dinner. Had a wonderful evening of laughs and camaraderie, and watched a little of “It’s Not That Hard” documentary. A bit cooler in the morning. Shannon walked the Tauhara Half course, and Kate & I ran up Mt. Tauhara. The track was rooty, narrow and steep – just how I like it! A few views on the way up but the summit was in cloud. Quickly put on gloves & a warm top. Spent a few minutes at the top before heading back to find Kate and accompanying her back to the summit. We didn’t hang around long as the cool breeze and cloud soon sent us scurrying down to shelter. The descent was fun! Light misty rain was starting when I reached the carpark. It was a quick trip for me: 34 minutes up and 20 minutes down. Under the challenge time of 1 hour! We then drove around to the finish line of the Tauhara Half, but it was raining so we didn’t hang around to watch people finish. Had a lazy afternoon at the house and departed for Auckland just before 3pm. A very enjoyable and inspiring weekend of running!